No amount of chest-beating can conceal the fact that the Maoist outrage in Bastar could have been avoided if both the state and the Central governments had not been so complacent. “THE most serious internal security threat", as stated by Prime Minister Manmohan Singh more than once, is more serious today than ever before. Boredom is good for the soul and children should be allowed to spend long spells that do not have anything to do with mind development. Observing and listening are great for learning about life. India was always such a land of wonders and contradictions that the great scholar-President Radhakrishnan, when writing the preface of his famous treatise on Hinduism, declared that every truth about this land is offset by an opposite fact that is equally true. India being granted observer status by the Arctic Council is significant as it would be part of the select group that will decide the future of the Arctic, which is in peril. If temperatures continue to rise at the current rate, island nations like the Maldives and coastal cities like Mumbai may come under water. The announcement in mid-May that India had been given an observer status in the Arctic Council along with China and four other countries hardly made a splash. That’s not surprising. For most of us, the North Pole is not just the top of the world but also the end of it. Why should India potter around in this vast ice-covered ocean surrounded by frozen wasteland is a good question to ask. “THE most serious internal security threat", as stated by Prime Minister Manmohan Singh more than once, is more serious today than ever before. Ups and down in Naxal violence is a consequence of their deliberate strategy and depends on their assessment of the government's strength and weakness. The government should not be taken in by the temporary drop in the number of incidents in some areas. The Naxals are trying to extend their foothold throughout the country and transform it into a revolutionary movement. They are far from their goal, but an attitude of complacency at the Central and state levels could prove disastrous. No amount of chest-beating can hide the fact that this tragic incident could have been avoided if both the state and the Central governments had not been so complacent. Only a few days ago, the Prime Minister released the UPA’s four-year report card in which success on the Naxal front was claimed as one of the achievements. With eyes on the elections and goaded by the romantics and clever-by-half leaders, the two governments had lulled themselves into belief that it was no longer a security issue and all that they had to do was to concentrate on development to win the polls. Without taking into account the ground realities, they walked into the Maoists' trap. From media reports it is apparent there were serious security lapses. Apart from the governments, the organisers too have to share the blame. 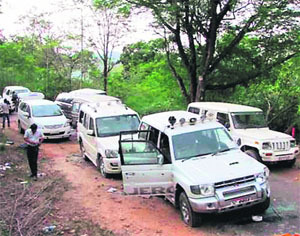 The ambushed Congress convoy in Bastar. It is a multi-faceted issue that cannot be tackled either by the use of brute force or by issuing unrealistic public statements about development work undertaken by the Central and state governments in the affected areas. The Naxal movement had entered a new phase after the merging of the major Left extremist groups in 2004 and the formation of the CPI (Maoists). They have since been attacking vital installations and persons, including politicians, large assemblies of people and police convoys. They have made no secret of their goal of throwing out the entire parliamentary system and replacing it with what they call their “revolutionary people's rule”. One has only to read their public statements which they have been issuing every few months to rally their cadres to punish the key persons of the “exploitative system”. The movement has roots in the colonial period during the Nizam of Hyderabad rule. In the earlier stages of the movement, after the Naxalbari uprising in 1964 in West Bengal, their targets were money-lenders and zamindars. In the next phase, they attacked policemen and police establishments. Then came the establishment of the “no-go zones” and the so-called “liberated areas” in which only their writ ran. The area in which the Congress convoy was ambushed falls into one such zone. Left-wing extremist movement is very different from other extremist movements. Their demand for social and economic justice for the tribals, the backward and the marginalised people are legitimate demands. Even political parties pay lip service to them. Unfortunately, the exploitative political and administrative system has become even more venal. The nexus between corrupt politicians, bureaucrats, police, corporate houses and criminals is getting stronger. The mining mafia is shamelessly exploiting the tribal land and depriving them of the most basic amenities for survival. Only a multi-prong strategy can deal with this multi-faceted issue. Security and development are two sides of the same coin. It is not a question of one after the other. The main political parties, instead of blaming each other, should unite in meeting this serious threat to our democracy and national security. The issue should be taken out of the electoral battle. Close cooperation between the Centre and the state governments is an absolute must. This is no time for making irresponsible statements like inducting the Army or making political demands that would only help the Maoists. Short-sighted utterances by irresponsible political leaders could create discord among the state police, central paramilitary forces, the Army and the Air Force and fuel anger of the public against the state machinery as a whole. Of course, those responsible for negligence, cowardice or security lapses must be punished, but bringing the entire system into disrepute would only help the Maoists. The Central and state governments must improve the quality of grass-root governance for better delivery of essential services and supplies to the deprived. They should ensure economic and social justice to the tribals by the effective implementation of laws meant to protect their interests. Much more needs to be done to improve the physical security of police stations in the affected areas, besides equipment and training of the staff posted there. All states should constitute a special force on the “Greyhound” model of Andhra Pradesh and strengthen the intelligence network to collect intelligence about their movements and activities in the interior areas. Only then will the police and the paramilitary forces be able to confront the better armed and trained Maoist cadres. India was always such a land of wonders and contradictions that the great scholar-President Radhakrishnan, when writing the preface of his famous treatise on Hinduism, declared that every truth about this land is offset by an opposite fact that is equally true. On Saturday morning, I read with pride that a boy of Indian origin had won the prestigious Spelling Bee award in the US. For the sixth year running, this prize has been bagged by an Indian student and it is now sometimes said in jest that no other community can ever hope to win this prize because Indians are the best spellers in the world. The irony is that the same newspaper where I read this was accompanied by the usual clutch of flyers that come each morning with our papers. The one that caught my eye was from a fix-it man who was a ‘speecailist’ in ‘lickages’. Another flyer advertised ‘luxuary’ cars, still another ‘chikan tikka’. And it goes on and on. I remember a small school in Samrala (where my husband was once posted as an SDM), which proudly declared itself Holy Child Pubic School and a club that called itself the Loins Club. Forget those purists who bemoan the lack of knowledge about apostrophes and split infinitives, what we have to tackle today is the ubiquitous disease of twitter-spell. ‘CU’ for ‘see you’, ‘mite’ for ‘might’, ‘wid’ for ‘with’ and so on. I know that English is a tough language where spellings are concerned and that, unlike Hindi, it is not phonetically logical but if one is going to teach it, perhaps we need to pay some attention to the way it is rendered in print. Several mandatory language exercises we were made to go through as schoolchildren are now considered a waste of time. Among those were transcription (to encourage writing neatly); dictation (for perfecting spellings) and elocution (for memory and pronunciation). One teacher punished us by making us learn two pages of ‘The Acts of the Apostles’ or a passage from Shakespeare by heart. Since I was often punished for talking in class, I benefited hugely from this ‘punishment’. Another favourite was making sentences with words that sound alike but have different meanings: key and quay; lightning and lightening. As compared to that Jurassic Age, we now have children attached to their hand-held devices, busy playing games. Their skill with a small keyboard is impressive but if you ask them to write with a pen, their hands get paralysed. Coping with silence and inactivity is another vanished accomplishment. With the summer holidays comes the problem of dealing with energetic children. I see young mothers driving them from one activity to another all day: clay-modelling, painting, origami, cooking without fire and God alone knows what. I do not remember the mothers of our generation doing any such thing: we left the kids to find their own entertainment and mostly it was books or indoor games. I wish to tell all anxious mothers boredom is good for the soul and that children should be allowed to spend long spells that do not have anything to do with mind-developing activities. Minds develop even when not productively engaged. Observing and listening are great for learning about life. The truth is that whether old or young, we have all forgotten the art of relaxation. While children are being dragged from one activity to another, retired folk – who should know better – are busy chasing jobs and assignments when they should be enjoying the fruits of their toils. When I quit working about a year ago, the most common question I was asked was, ‘What will you do now?’ As if all that made life worthwhile was the rat race that kept you chained to a routine from morning to evening. In this last year, I have read, written, translated, travelled, cooked for friends, seen more movies than in the past 30 years, and felt younger than ever. The joy of drinking your morning cup of tea with a crisp newspaper, having a leisurely breakfast and not rushing through a bath before driving through rush-hour traffic — all these have given me a vision of heaven on earth. I pity those who could have all this but choose not to avail of it because they dread dealing with leisure or losing control over other lives. If only the seniors would choose to hand over while the young are young, we would not see the spectacle of political parties presided over by a mummy or daddy, sometimes even a grand-daddy. To face the ignominy of a disgraceful exit (such as Arjun Singh) is far worse than retiring when you know that there is an impatient world waiting for you to make place for a new generation. Those dreaming of leading this country when they are in their eighties must realise their days are over. The ‘luxuary’ of choice is not theirs any more: move on before being turfed out. The young are tweeting their thoughts but you lack the eyes to see and the ears to hear. Sip that morning cup of tea with birdsong in your ears rather than curses muttered behind your back.